Product Detail Summary: Create Murloc groups to give your coastline encounters with these infamous creatures or have them accompany your favourite characters as companions all across Azeroth and beyond. The Creature Pack also comes with one mystery creature like the Diseased Ghoul, to befriend new companions, become new pets and create new encounters for the Alliance and the Horde. Present your creatures with the included life-sized Hearthstone and pronged rock pedestal to display your very own magic item from the World of Warcraft universe! 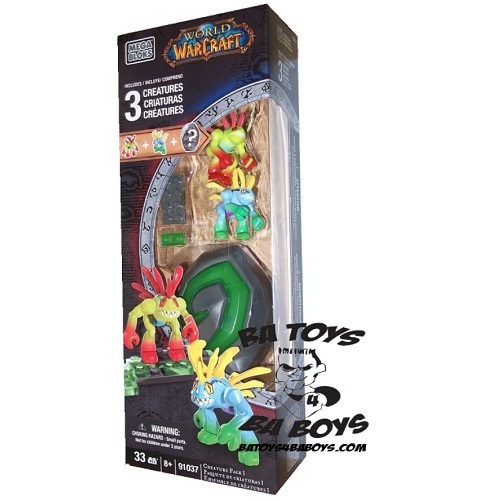 Ideal for Warcraft fans ages 8 and up.